I have been having some dryer issues so my youngest brother Mark came over to see what he could do to fix the issues. When he walked in the door he handed me this! A cast iron dog. He had gotten this at Hobby Lobby and decided to paint it. 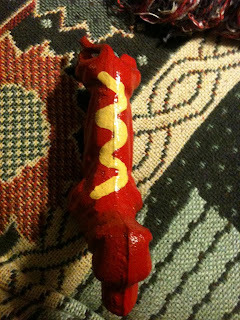 After painting it his wife Kim told him it looked like a hotdog. Mark then added the yellow paint.... MUSTARD. I love it. This next pic was not taken by me. But this is my brother Mark in Fla. holding his catch of the day! Pretty big. 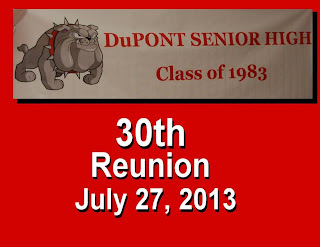 I had the honor of photographing the class of 1983 DuPont High School Reunion recently. It was a blast. My sister in law, Kim graduated with the class of 1983. The class that turned out. My brother in the orange. My projects for the weekend started with me getting the pics to my niece Holly for her to give to her mom and dad, and one to her granny. I had taken these weeks ago. Framed them and had them in gift bags with a card for Holly to give out. 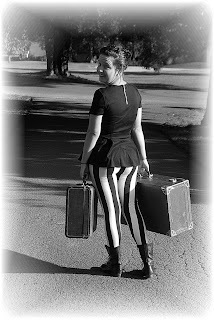 Holly left for college for the first time on Sat. I thought this was just the thing for her to give. Then the next step of projects was to put a final coat of sealer on my other niece, Jessica's TV stand I did for her. These two things took place on Friday evening. Saturday I started a painting that I am giving as a birthday gift. Started and finished.